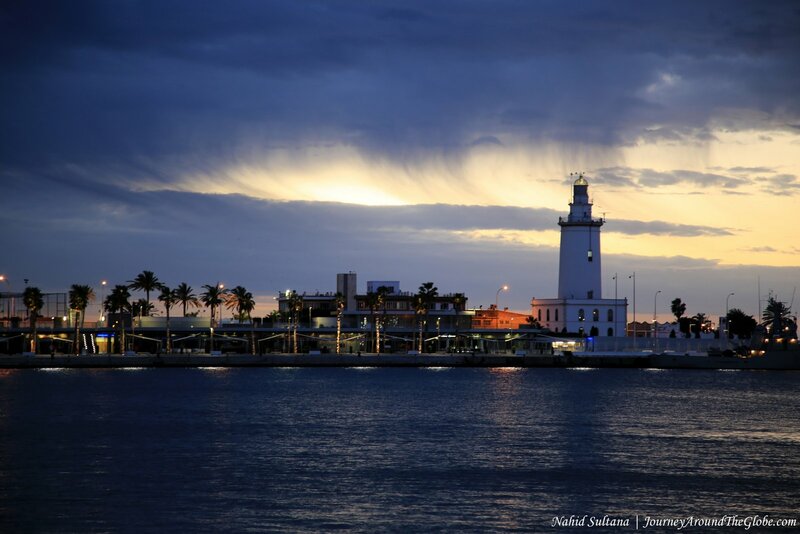 MALAGA, SPAIN: “From a white father and a small glass of water of Andalusian life was I born. Born from a mother, daughter of a daughter aged fifteen from the district of Percheles in Malaga; that beautiful bull that engendered my forehead crowned with jasmines.” That was what the famous Spanish painter Pablo Ruiz Picasso said who was a talented son of Malaga. 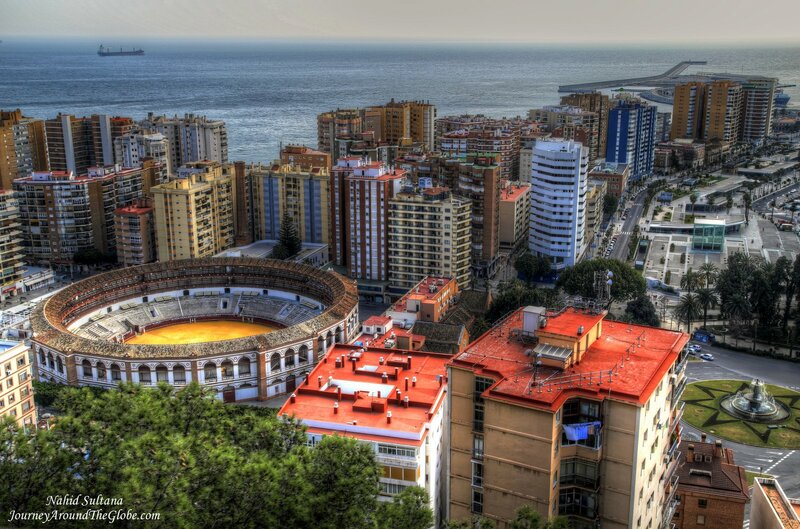 Malaga is a big city in southern Spain and the largest city on the Costa del Sol. But unlike Barcelona and Madrid, Malaga didn’t give me a big-city feeling. 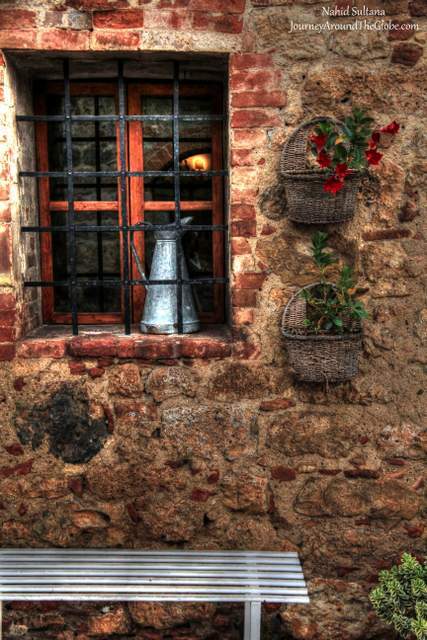 Its old town setting still has a welcoming vibe. In summer, Costa del Sol region can be packed with tourists because of its appealing coastal line and beautiful sun and sand. Not only Malaga, but whole of Andalusia seems like is decorated with orange trees; you can see them standing on the both ways of streets or almost anywhere you go. But don’t make mistake of eating them…not sweet at all. Historically, the city was founded by the Phoenicians in the 8th century BC, on the lower slopes of the Mount of Alcazaba. Romans came here at the end of the 3rd century BC. In 711 AD, it fell in the hands of the Arabs, came to be part of the Cordoba Emirate. Some time later, from the 10th century onwards, it became prominent again amongst the Southern peninsula towns as first harbor of the Moorish kingdom of Granada, from where its major merchandise were shipped. Finally, the Catholic Monarchs conquered Malaga in 1487. 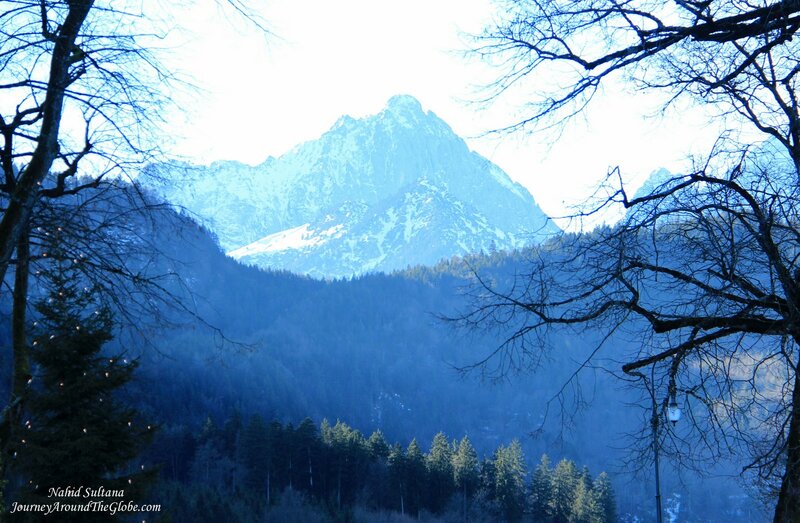 TIME of TRAVEL: We made our second trip to Spain this February of 2014. First time we came to Barcelona and Madrid during the winter break of 2011, so this time we were off to explore southern Spain, the most beautiful part of this country…Andalusia. We flew directly to Malaga from Charleroi. The weather in Malaga was fantastic. It was a bit chilly in the morning and after dark but bright and sunny during the day. Going from gloomy Belgian weather, it was a nice treat for all of us. 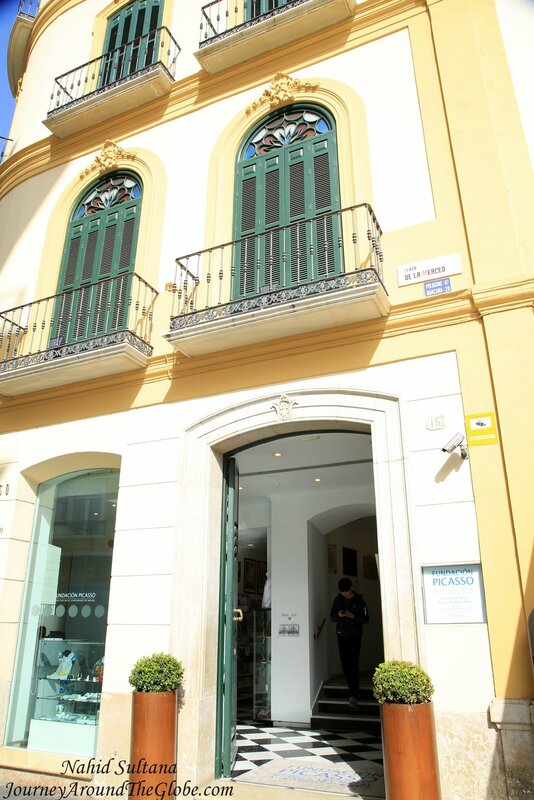 OUR HOTEL: We stayed in the heart of Malaga, few steps away from Plaza de la Constitucion. Hotel is called “Hotel Petit Palace Plaza Malaga”. The price didn’t include free breakfast (could get breakfast for 8 euros per adult) but had Wi-Fi in our room. The location of this hotel couldn’t have been any better. 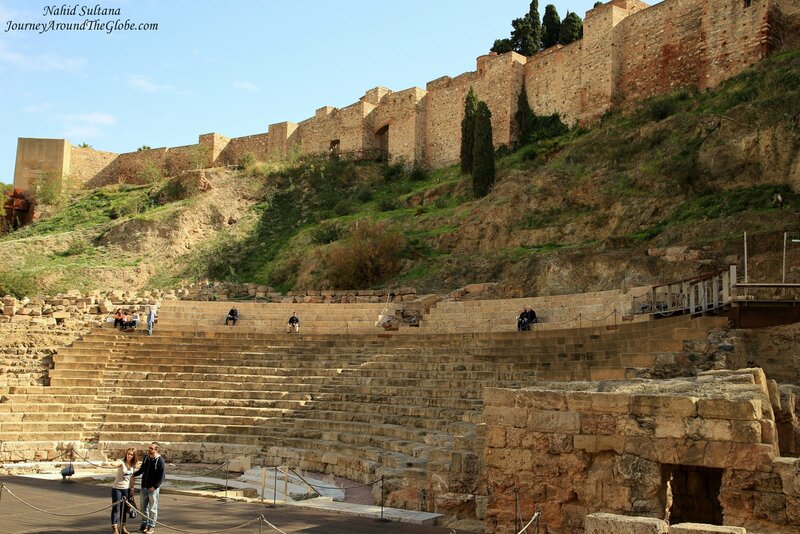 It was within walking distance from the cathedral, port, Alcazaba, and Roman Theater. Not to mention there are tons of shops and restaurants in this area. You can get typical Spanish dishes as well as some international cuisines. Probably only one downside of this hotel was that it didn’t have a parking garage close to it. Since we rented a car, my husband had to park near the harbor and walk about 15 minutes to the hotel. EATING and SHOPPING: We had our first dinner in Restaurant Plaza very close to Marquis de Alrios. And of course when you are in Spain you have to try paella and tapas. We went for seafood and chicken paella and a mixed variety of tapas. 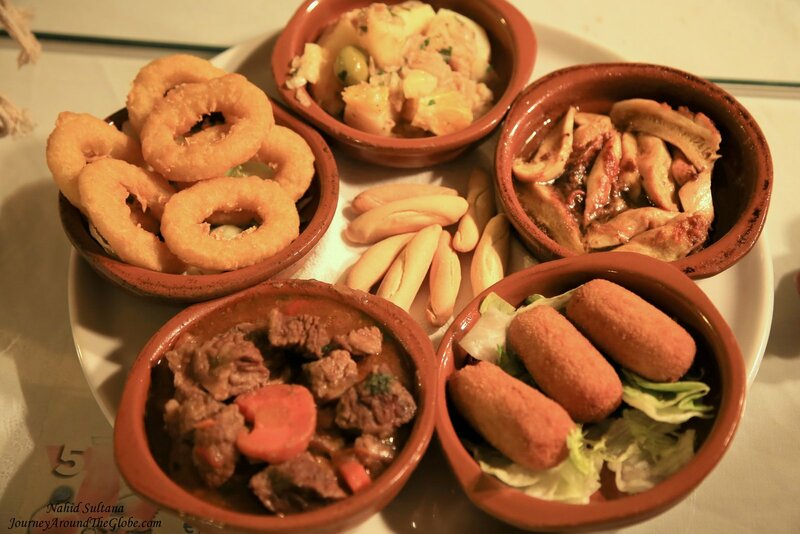 Tapas are basically appetizers or finger foods that originated in Spain. You can get all sorts of options in tapas, like marinated olives, fried calamari, fried squid, fish fingers, chicken balls, beef stew, and many other yummy knickknacks. Gazpacho soup or cold tomato soup, is very popular in Spain too. We tried it last time in Barcelona but I am not very fond of cold food, so didn’t try it this time. But it’s definitely something very Spanish. Then next day our lunch was near Roman Theater in a restaurant called, “Teatro Romano” where we ordered some pasta, but was very disappointed with the taste. For those souvenirs hunters, old town near Alcazaba or cathedral are good places to buy some memoirs from Malaga. Small flamenco dresses are nice for little girls. Colorful potteries hand-painted in Spain, Spanish saffron or paella spices (if you are into cooking), flamenco designed apron or statues, and ceramic bulls are just some things I can name to remember your trip in Andalusia. 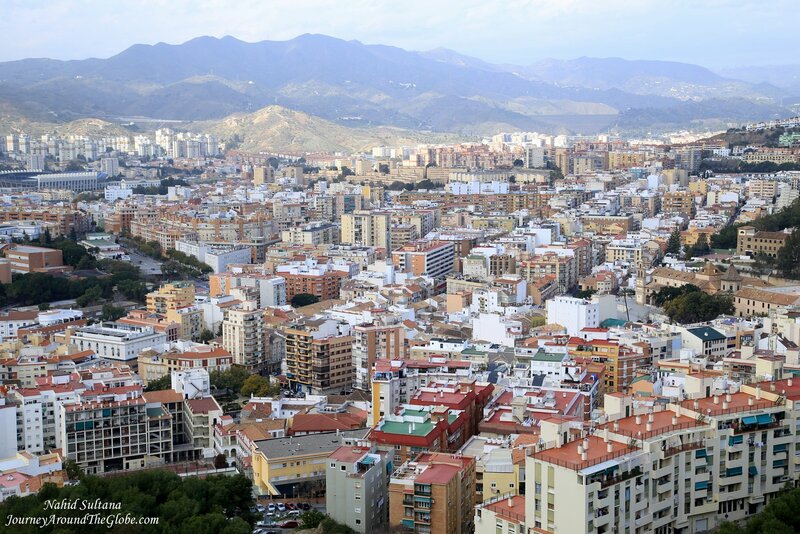 PLACES WE’VE VISITED: We had about a day and half in Malaga. And I managed to wake up one early morning here to go to the port and take some shots of the sunrise. It was fantastic and I absolutely loved it. There are many beaches and luxury resorts near Malaga and closest one to the city center is La Malagueta. We didn’t really go to any beach because the weather was not really hot to go to the water. Another place that we just saw from a distance and didn’t really take a tour inside was Malaga Bull-Ring or Plaza de Toros de la Malagueta. But this may be something that will interest many tourists. Malaga Bull-Ring also has a museum, Museo Taurino. Flamenco show are something really exciting to see in Spain, which we did in Cordoba in this trip. But if are interested, I’m sure your hotel can tell you where to go for a nice flamenco performance. If you have spare time and hungry for more sightseeing, drive or take a train to nearby cities like Granada, Cordoba, or Seville where you can see the rich history of Andalusia from the Muslim era, which makes Spain a unique country overall. 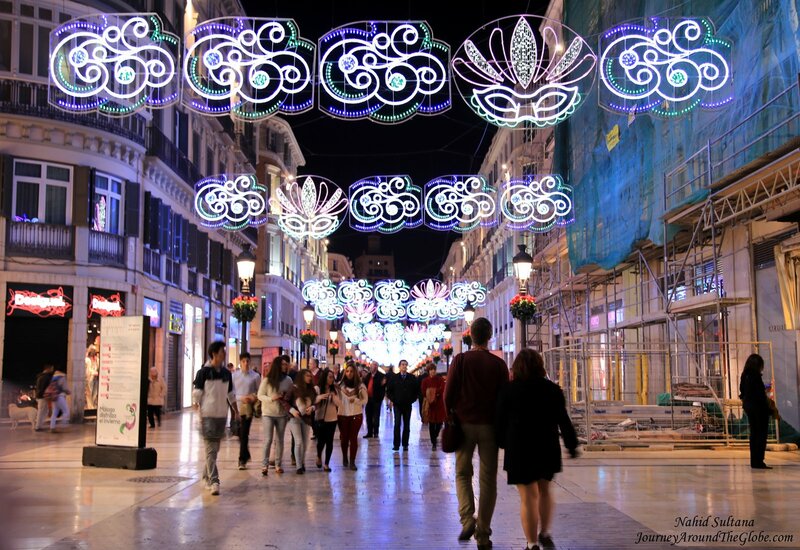 1) MARQUIS de ALRIOS: This is a long stretch of pedestrian street in the city center with lots of stores. It was right in front of our hotel and let me tell you, shopping was fun here. The street had beautiful lighting at night and gets really lively after dark. Marquis de Alrios has the Malaga Port (the port is actually across the street) at one end and Plaza de la Constitucion at the other end. 2) PLAZA de la CONSTITUCION: This is a nice square at one end of Marquis de Alrios, very close to our hotel. 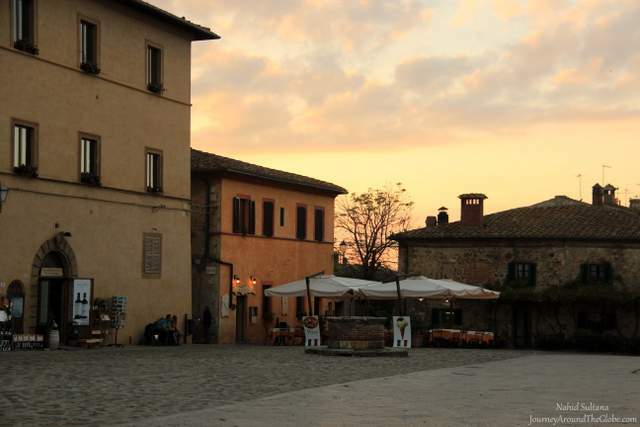 There are plenty of small alleys that starts from this square, great to just wander off. 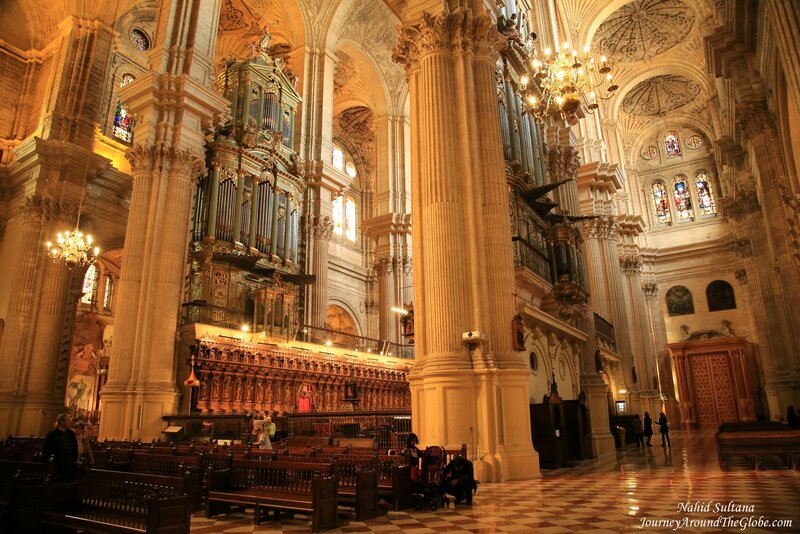 3) MALAGA CATHEDRAL and MUSEUM: This is a beautiful cathedral and definitely worth a visit. It is grand outside and inside. Interior is very ornate and huge. The decorative altar is the main focus and can’t miss total of four church organs. Museum of Malaga Cathedral is small with only couple rooms (we were done in 5 minutes) and located on the upper level. It holds some biblical paintings and statues. 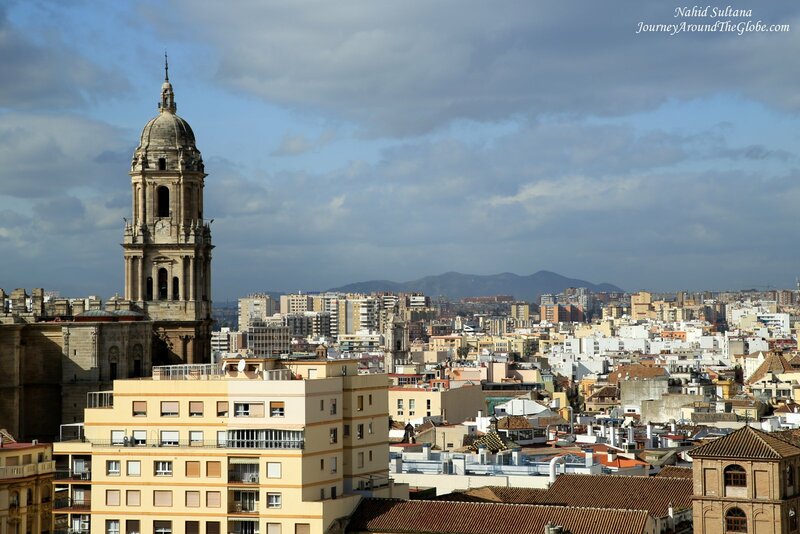 The cathedral is located in the heart of Malaga city center. We paid 5 euros per adult to go inside the cathedral that includes its museum too. 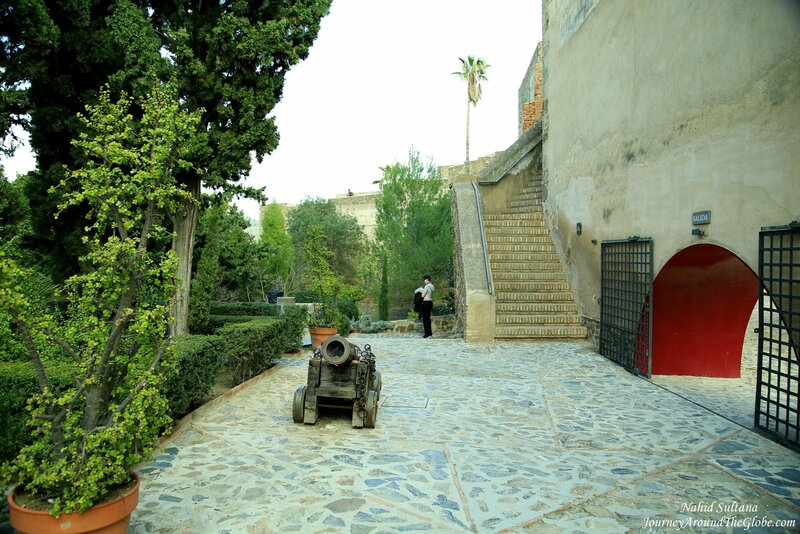 4) ALCAZABA de MALAGA: Alcazaba has to be a must-see place in Malaga. This Moorish palace fortress has been standing on a hill since the Muslim era in Andalusia and is one of the emblematic monuments of this town. 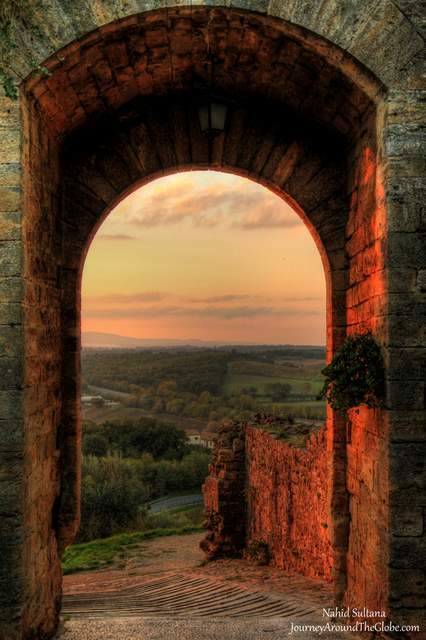 It is the best preserved of its kind in Spain. Roaming around this old fort took me back to our trip to Morocco where we saw similar ‘Kasbah” style palaces. This impressive group of buildings, originally dating from the 11th century, formed the palace-fortress of the Muslim rulers of the city. The palace inside this precinct was built around that time but the greater part of it is from the 14th century. 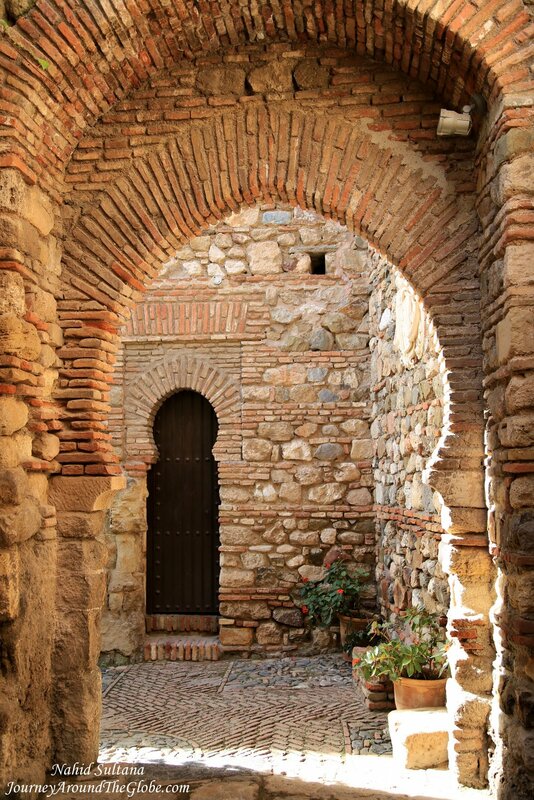 Most of Alcazaba was built of limestone which crumbles easily. That’s why the fortress went under many rebuilding and restorations, last one being in 1930. 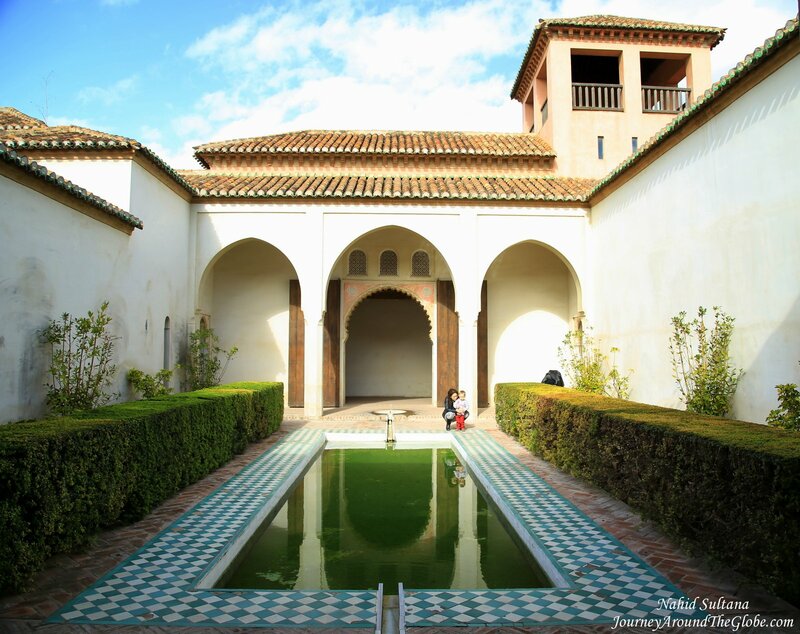 The Nasrid Palace is reached through a restored pavilion. The Orange Patio and Patio de la Alberca (with a pool) are remarkable. 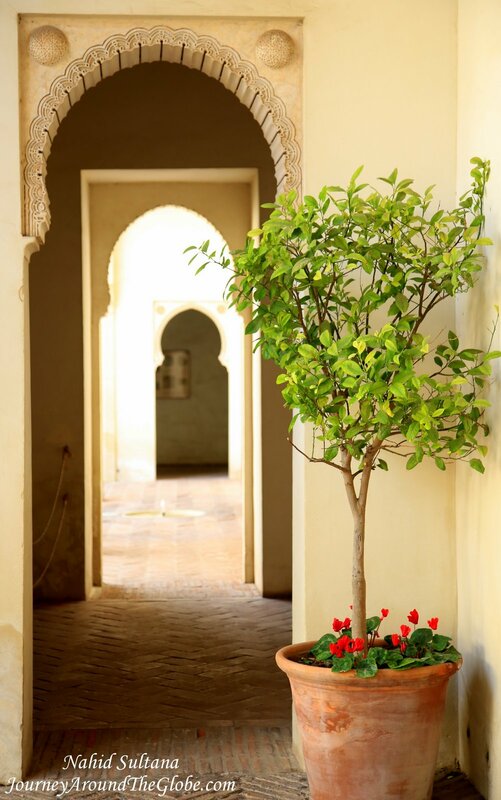 These courtyards and gardens in Nasrid Palace are some picture perfect places and shouldn’t be missed. Different sections and ramparts of Alcazaba offer excellent views of the port nearby and the whole city. Don’t miss the exhibition on Muslim influenced ceramics and potteries. A small museum holds numerous items that they found from excavations on this site. Loved all the big and small courtyards, some with rows of caliphal arches and marble columns. 5) ROMAN THEATER or TEATRO ROMANO: At the foothill of Alcazaba is Roman Theatre. 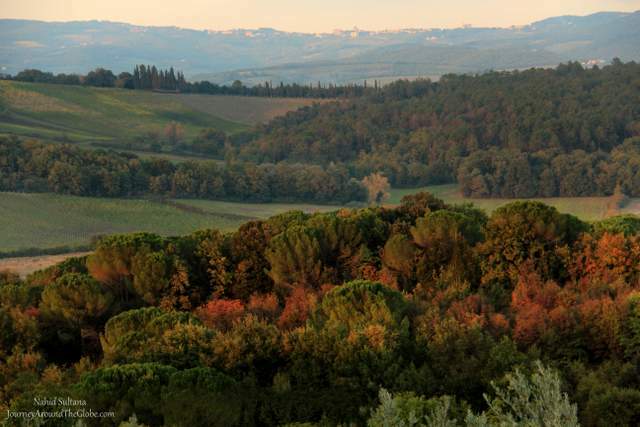 Built during the first years of the reign of Augustus (1st century A.D.), it was kept in use until the end of the 3rd century. The remains of this theater can be viewed anytime from the plaza in front. Tourists can walk on its old stone steps and explore this ancient site without paying any fees. 6) PICASSO’S BIRTHPLACE HOUSE or CASA NATAL de PABLO PICASSO: After Roman Theater and lunch, we walked over to the birthplace of world renowned Spanish painter and artist Pablo Picasso. Picasso’s relationship with his native city was distant but nostalgic. And it was thrilling to think that I was roaming around in Picasso’s city, Malaga, visiting the house where he was born and spent first few years of his childhood. On the first floor, some temporary exhibition was going on an artist who was influenced by Pablo Picasso. In this building, on the 2nd floor, Pablo Picasso was born on October 25th, 1881 and lived here until 1884. This 19th century building houses works and objects of the artist and his family. Many documents, photographs, and personal belongings of the Ruiz Picasso family decorate the floors of this museum which witness the deep connection he had with his home town. You can also see some stuff that he created during his childhood. A specialized library and on-going program of temporary exhibitions and cultural activities complement the offer of Picasso’s Birth House. The museum was opened to public in 1988 and is located in Plaza de la Merced which used to be a busy square back in Picasso’s time. An obelisk in the middle of this plaza was erected dedicating Torrijos and his comrades executed by firing squad in 1831 and whose remains lie there since 1842. 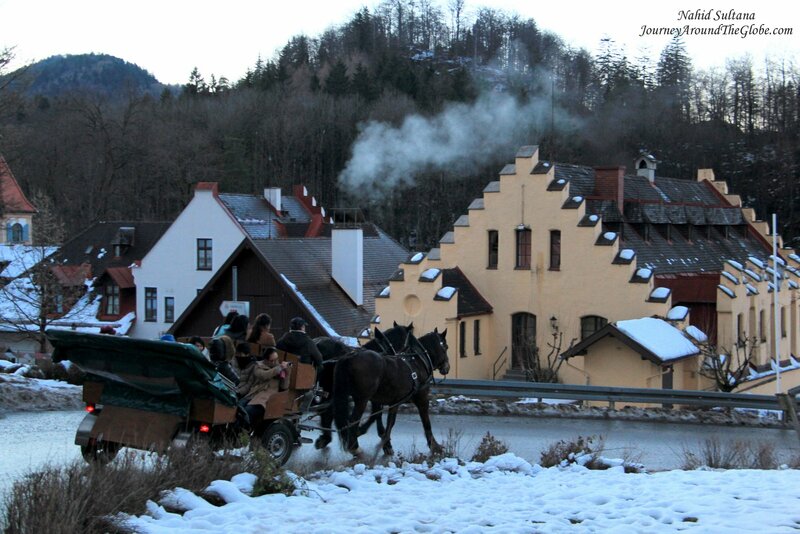 Museum is open Monday to Sunday from 9:30am to 8pm and closed every Tuesday in winter. It was 3 euros per adult. We couldn’t take any pictures inside the museum. It has two floors and took us less than half an hour. 7) CASTILLO de GIBRALFARO: This is another Moorish castle which was built to protect Alcazaba and to keep an eye on the port. This has been used as a coastal lookout post since 1487 and was used exclusively for military purposes. A small museum, an old powder keg area from the 18th century, has exhibition which reflects castle life as a garrison and coastal watchtower from the 15th century. You can see urban evolution, weapons, uniforms, and objects of daily life from the 16th to 20th century. Gibralfaro also has an incredible view of the whole Malaga, may be better than Alcazaba since it sits on a higher ground. But there isn’t much to do or see here other than walking around different ramps among the old walls (you can also walk on the walls of this fortress) and checking out views from different angles. 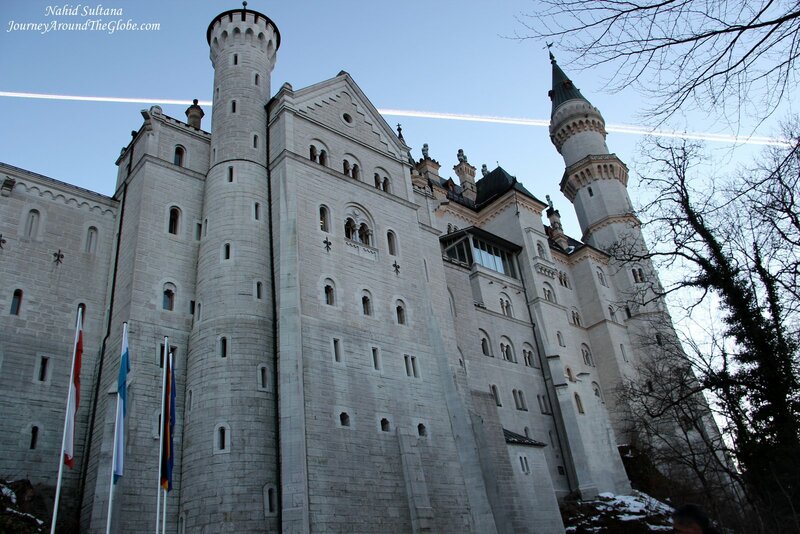 This fortress is open from 9am to 8pm in summer and 9am to 6pm in winter. Although Gibralfaro looks over Alcazaba, the two monuments are not connected from inside anymore. We took taxi here from Picasso’s Birthplace House (was around 8 euros), but saw many people walking up the ramp (which can be a bit difficult with kids) and some also took Bus #35 to reach the top (2.20 euros per adult). We walked down on our way back which was easier and fun; you get to see many nice sites including a bird-eye view of Malaga Bullring. 8) PICASSO MUSEUM: Pablo Picasso is known as the father of Cubism and inventor of images that are syntheses of multiple viewpoints…both formal and conceptual. The Renaissance building that houses the museum is itself a historic building, known as Buenavista Palace. In addition to Picasso’s works, the palace has an architectural site with remains of 17th century BC Phoenician Malaga as well as the elements dating from various periods of the Roman era and parts of the old Golden Age building (some from the 6th century). This museum has life works and the largest collection of Pablo Picasso. The collection here spans eight decades of Picasso’s career, which is essential for an understanding of Western art. The displays in this museum show his relationship with Malaga and the unlimited versatility of his artistic talent. After Picasso died in 1973 in France, most of the collections here were donated by Picasso’s grandson Bernard Ruiz-Picasso. Some of his famous and exclusive paintings that we were lucky to see here includes “Mother and Child”, “Acrobat”, and many more. Picasso Museum took us about an hour to visit all the rooms with displays. Ticket is 6 euros per adult. 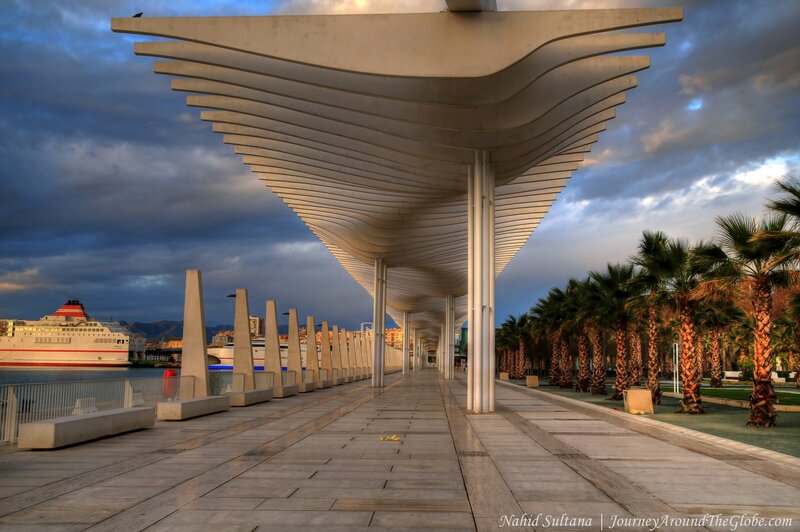 9) MALAGA PORT or HARBOR: This was not in our itinerary. It was so close to our hotel that I decided to take a walk before sunrise on our last day in Malaga. It is definitely a hype and trendy place to hang out or come for meal during normal hours. There were plenty of restaurants and shops on one side of the harbor facing the water. Although everything was closed, anything looks extra beautiful during sunrise. Spires of Malaga Cathedral and old walls of Alcazaba can be seen from the harbor. I walked all the way to the lighthouse there. There wasn’t much to do at this early morning, but that was one of the beautiful strolls I took in a long time. TOURNAI, BELGIUM: Interestingly, Tournai (or “Doornik” in Dutch) is a French-speaking Flemish town of Belgium. Meaning it is in Wallon region (French part) with lots of Flanders (Dutch) influences. This is in the Province of Hainaut which is very scenic and traditionally, rich in culture and heritage. Situated by River Scheldt, this is considered as one of the oldest cities in Belgium. It was badly damaged during WWII. Since then the city authority has been restoring the city to its old glory. If you are in Brussels and want to visit a less touristy city of Belgium, Tournai makes a perfect day-trip from the capital of Europe. This was the religious capital of Flanders many centuries ago. Tournai marble/limestone is well-known in this region and was once used for sculpted items, especially in churches. 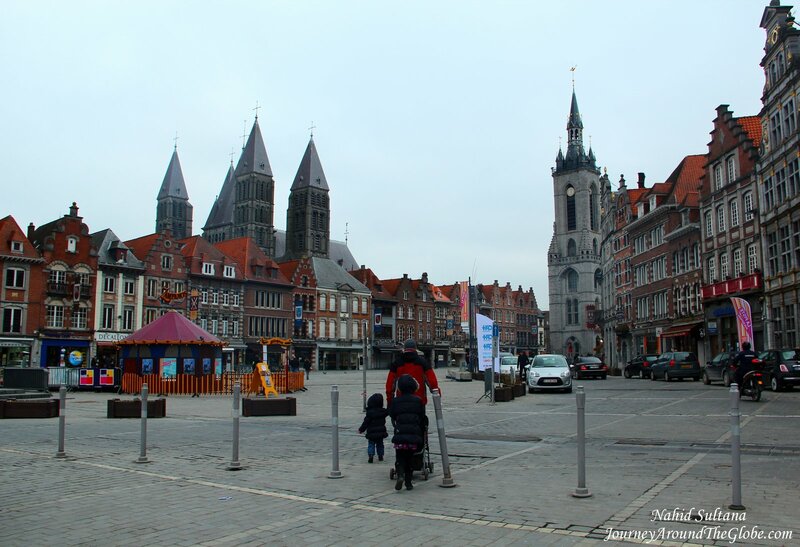 TIME of TRAVEL: We visited Tournai in March of 2013. It was a cold Saturday in Belgium. Everything was empty in Grand Place and other parts of Tournai. EATING and SHOPPING: Old town, especially Grand Place had some restaurants, cafés, and quick food places. I can’t even remember where we had lunch or if we had lunch in Tournai at all. Historically, tapestries and draperies of Tournai are very famous and belong to the great Flemish school of tapestry. Being a Belgian city, you will find many chocolates and waffle stores by default. Grand Place had plenty of other stores for shopping too. 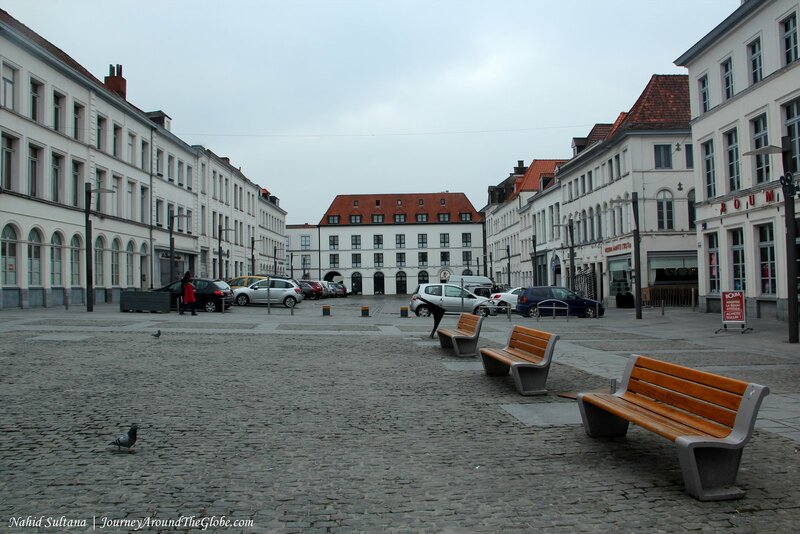 PLACES WE’VE VISITED: We literally spent only couple hours in Tournai. There are lots of things to do here. Since the weather wasn’t very pleasant, we kind of hurried and took a crush tour thru the city. Although we didn’t visit them, two of the oldest private houses in Europe (from the 12th century) are located in Tournai. If you can manage, visit the old city gates, museums, and Pont-des-Trous…a 13th century bridge on River Scheldt. 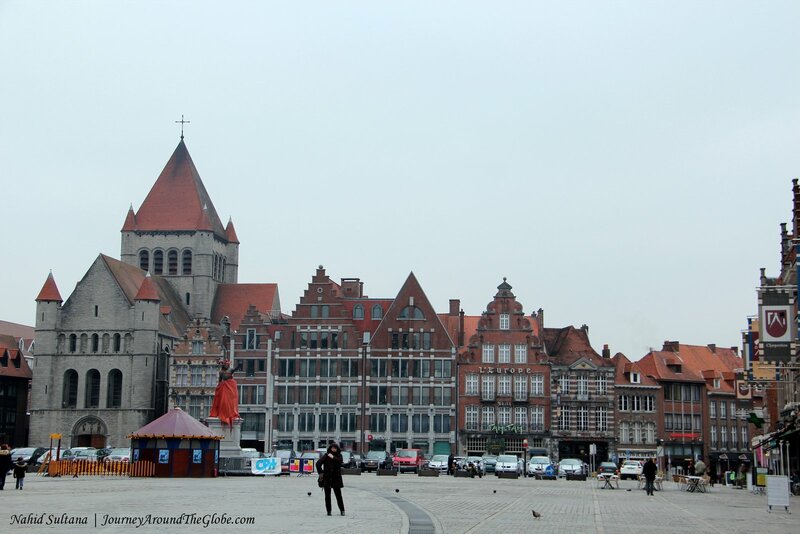 1) GRAND PLACE and CLOTH HALL: Grand Place is main square or heart of Tournai, like any other Belgian cities. 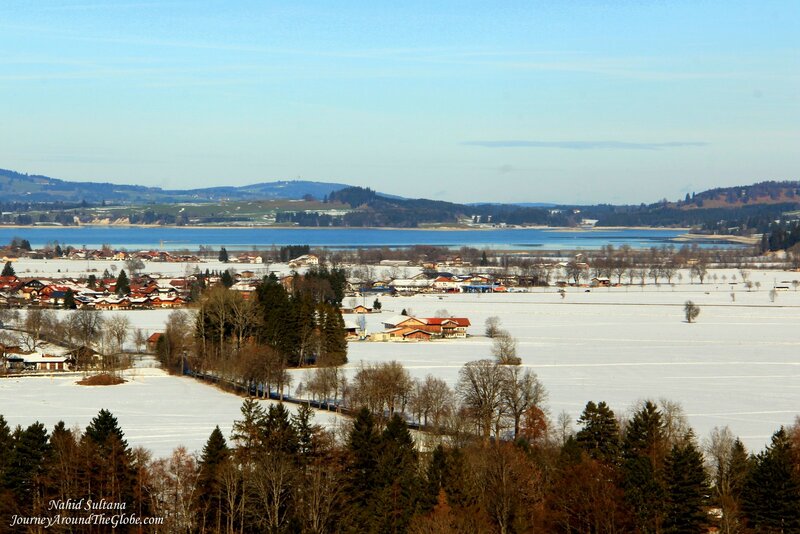 It has several old buildings from the 15th and 16th century. There was a big fountain in the middle which was closed due to chilly weather outside (?). 2) SAINT QUETIN CHURCH: This is an old and beautiful church in Grand Place. The building caught our eyes and entrance was free to go inside, so wanted to check it out. It is a nice big church, and you can tell it has been standing there for a few centuries. 3) THE CATHEDRAL of NOTRE DAME de TOURNAI: This Romanesque and Gothic style cathedral is a UNESCO World Heritage Site of Tournai. The original cathedral on this spot was built somewhere around the 5th century. The current look of the cathedral is from the 12th century. The nave is in the Romanesque style and inspired by Norman churches. Later, the vaulting of the transept and the construction of the chancel were inspired by the Gothic period, with very high walls. 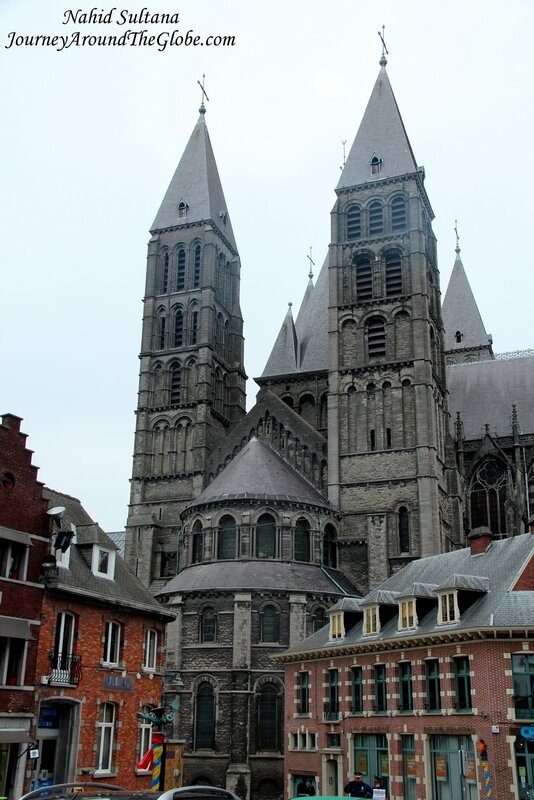 The Gothic choir of this cathedral is a Flemish art element, very typical of this region. 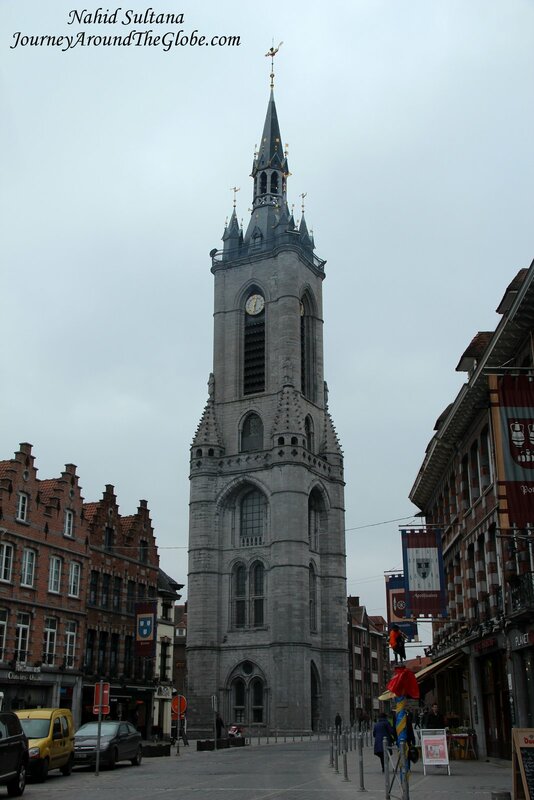 4) BELFRY of TOURNAI: This is the oldest belfry in Belgium and a UNESCO World Heritage Site. The construction of Tournai Bell Tower started from 1188. The spire is crowned by a dragon and the turrets are topped by statues of soldiers defending the city. 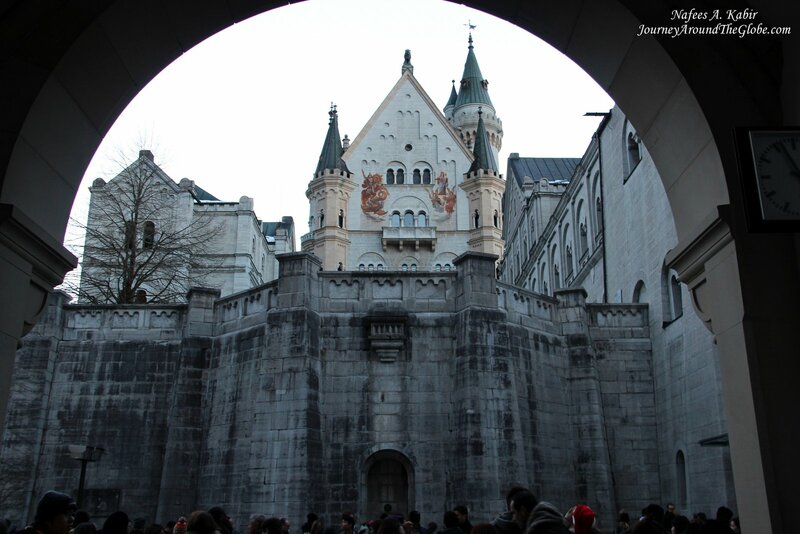 The tower is 70 meters high and there are 257 steps leading to the top. It was closed and we couldn’t go up to the top. 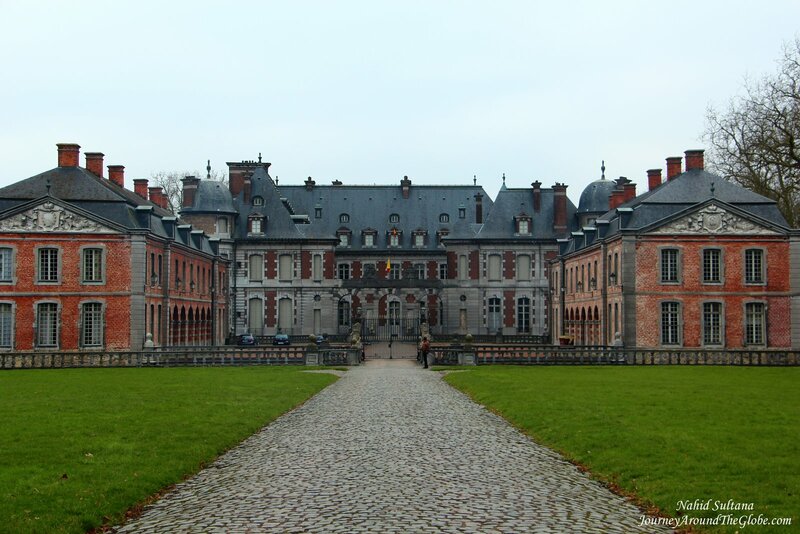 5) LE CHATEAU de BELOEIL: After we were done with Tournai and heading home, we took saw a sign on the road side for this castle or château. 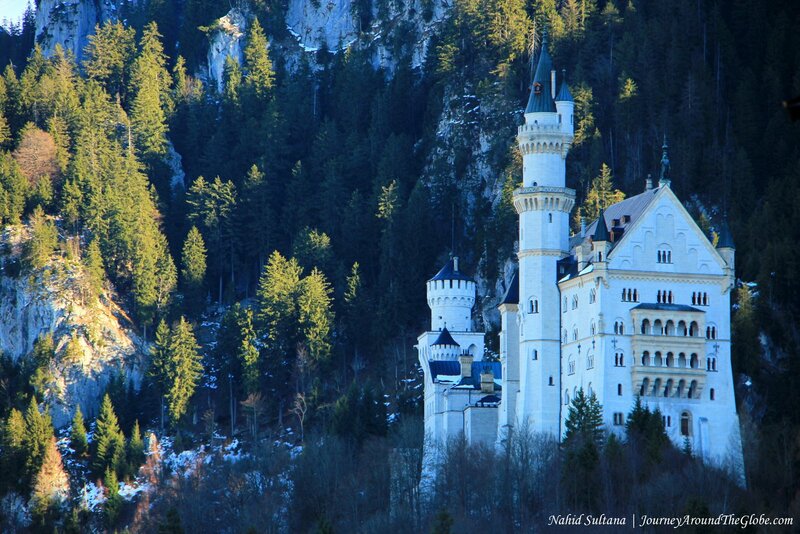 Feeling curious, both my husband and I were curious to see this castle. After lots of twisting and turnings, we finally reached Le Chateau de Boleil. 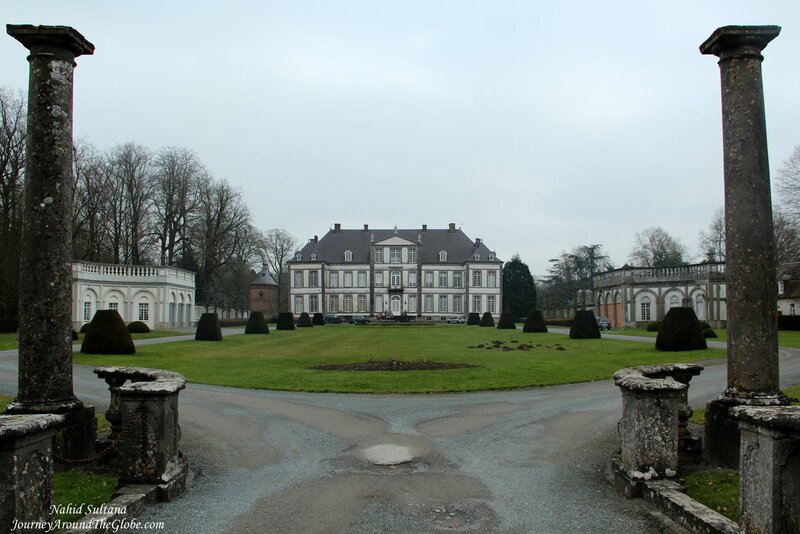 If I am not mistaking this small town in Wallonia is called Beloeil. 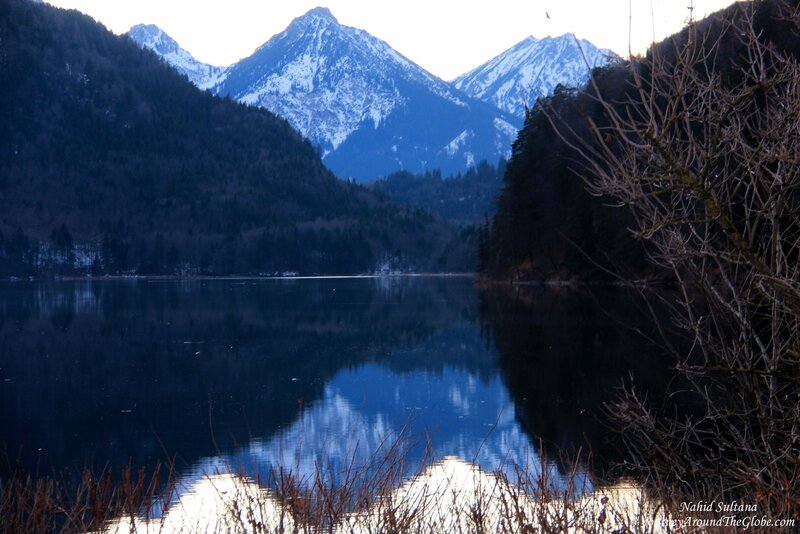 The château sits on a majestic pond surrounded by beautiful landscape. The castle belonged to the princes “de Ligne” dynasty is one of thirty generations of lords, vice-rois, ambassadors, senators, warlords, writers, aviators, settled in Beloeil since 1394. We didn’t go inside the castle and not sure if it can be visited at all. 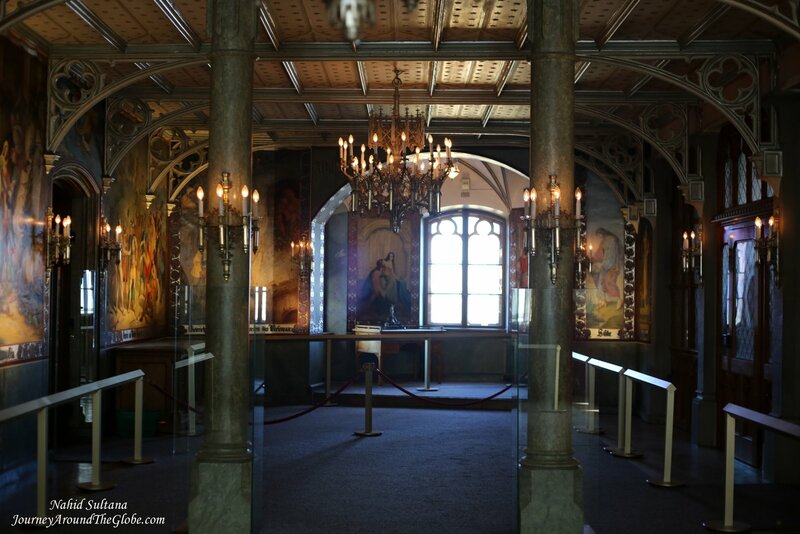 But it holds some fine paintings, furniture, and dishes dating essentially from the 14th century. 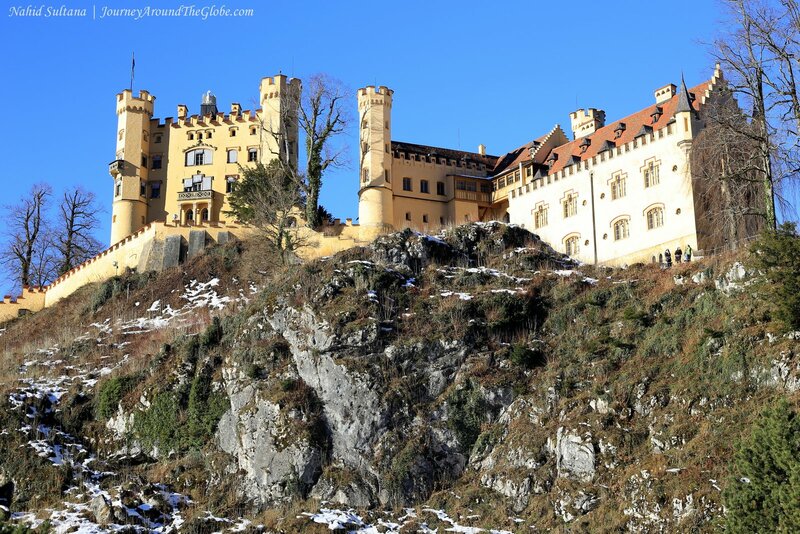 Library of this castle is famous of housing some 20,000 old leather books. 6) CHATEAU d’ATTRE: This was another château or castle we passed by while heading back home from Chateau de Beloeil. This was more like a big mansion in a beautiful setting. From the outside information board, it looked like that the castle and its park are open to visitors.